Before I get into the festival, I’d like to mention a few other things. Tomoe has been crazy. Well, she’s been going to sleep at night much better now, but she is still very active and very noisy. One thing she’s done is give herself some bruises. I’m pretty sure I know how she got one of them, but the other is a mystery. In fact, that mystery bruise is nearly a black eye! A dark bruise on the right and a red mark on the left. Tomoe’s been showing some pretty good dexterity lately. She holds things and manipulates them well with her fingers. 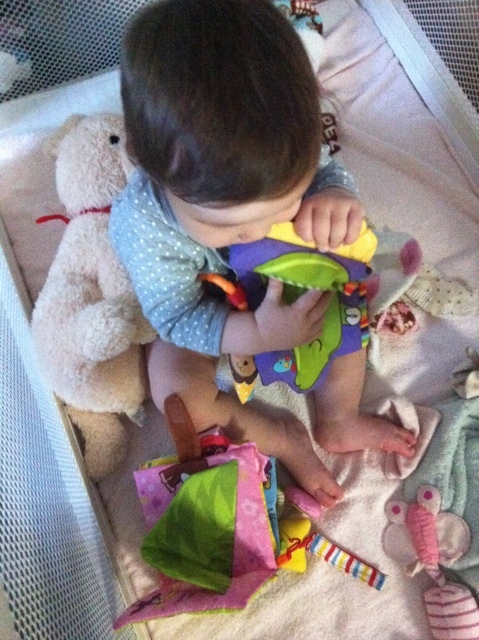 She’s been able to amuse herself for up to an hour with her toys, which is great for us to be able to relax. She seems very interested in this toy. Unfortunately, she always drops them over the side of her bed. Eating a book. She’s supposed to be reading it, not eating it! She’s been able to stand on her own for more than a minute now. 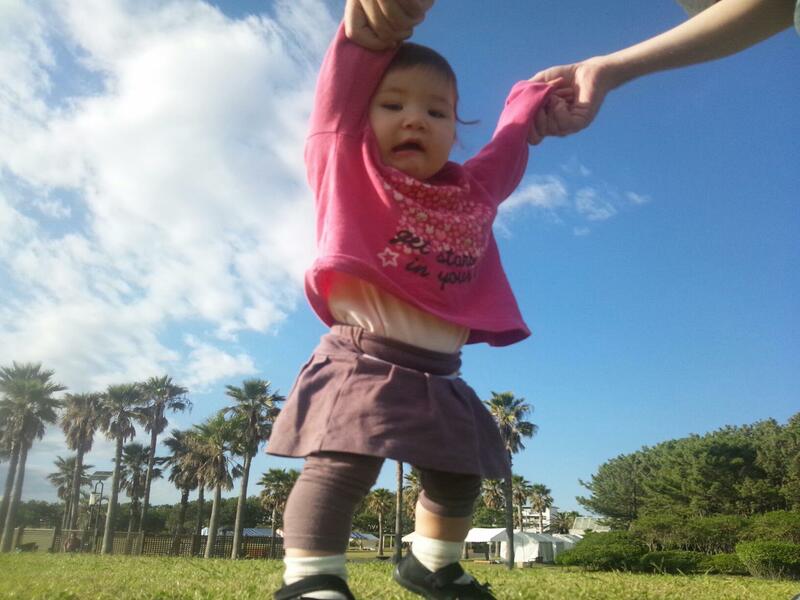 Her balance is getting much better, but she has limited coordination between her feet. No walking yet. 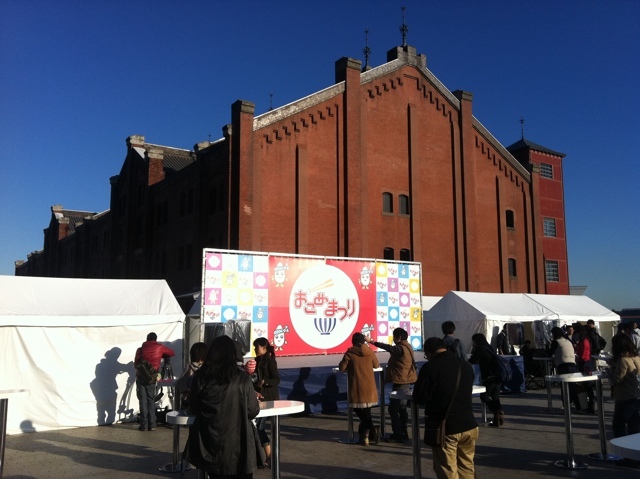 On Friday (yesterday), we went to Yokohama to attend the Okome Matsuri (Rice Festival) at Aka Renga Soko (Red Brick Warehouse). We met my wife’s sister at Sakuragicho, then started walking to the festival. 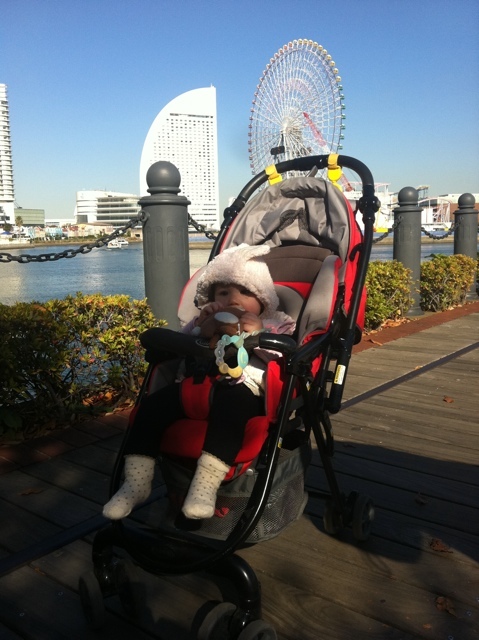 Tomoe with the Cosmo Clock ferris wheel and sail-shaped Intercontinental Hotel behind her. The food was good. I ate plenty of rice, karaage (fried chicken), grilled chicken, tuna gyoza (Chinese style dumplings), and shrimp tempura skewer. The weather was beautifully clear, although a bit chilly. The warehouses are now a shopping centre. There are two buildings, and the site is often used for events. Every winter, an outdoor skating rink is set up, although it almost never goes below freezing due to Yokohama’s mild subtropical climate. 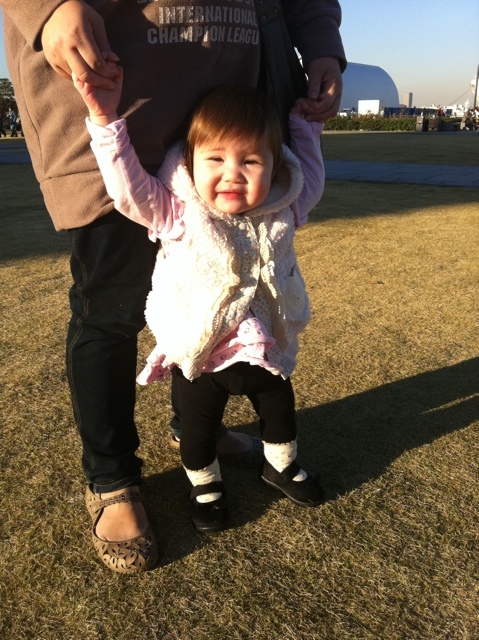 We then left the festival and went out to the park where Tomoe could try some walking. The first time Tomoe touched grass. She’s not very happy. 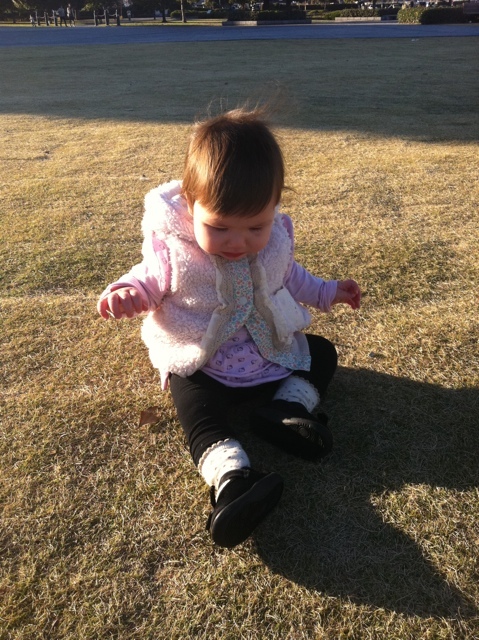 In fact, she started crying because she didn’t like how the grass felt. Tomoe is being helped to her feet by her Mommy. She’d smile, but the sun was a bit too bright. On our way home, Tomoe sat with us on the seat, sort of. Most of the time, she stood up looking out the window, but she kept hitting the window and squealing. She was a bit noisy and very crazy. She was very restless on the train. Usually, she’s pretty calm on the train. I’m so happy she’s sleeping right now. 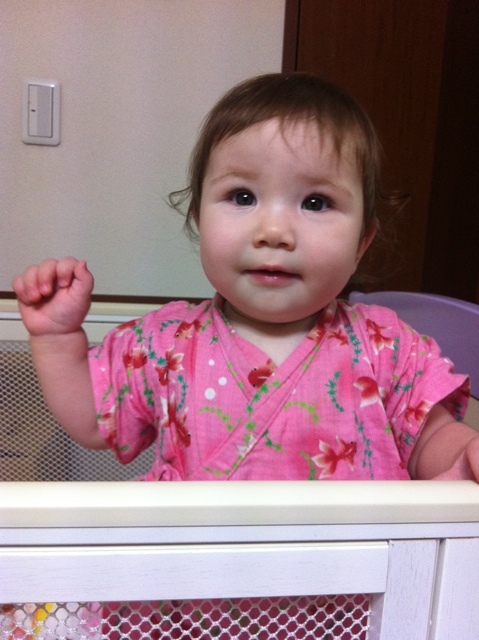 Tomoe has just turned 9 months old. Her personality has been showing quite a bit lately. She can be pretty funny. We know that she likes the colour green. 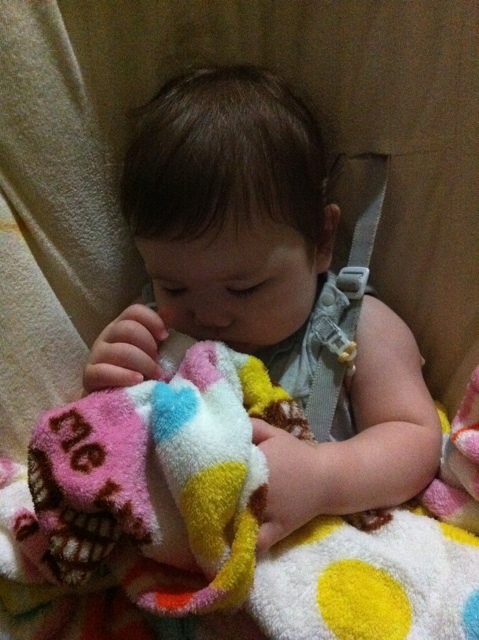 She also loves her blanket, as well as her new toy stuffed dog. She finds puppets quite funny. She also thinks that wiggling our feet is funny. She watches shadows. She hates the vacuum cleaner. 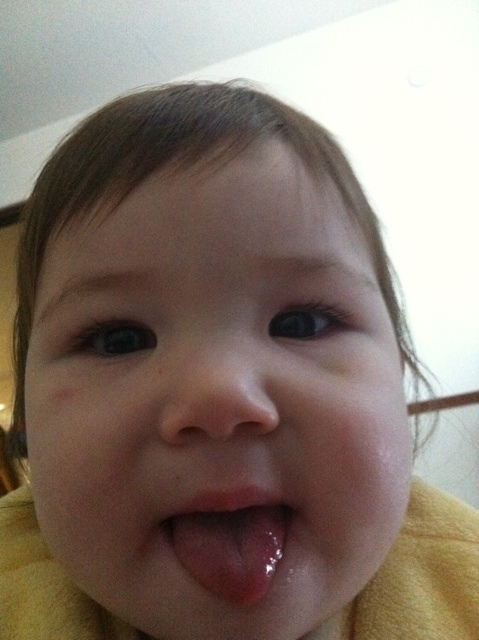 She’s started laughing at more than just funny sounds, she laughs at funny faces. She laughs at laughing. She likes dogs and cats. She still likes ocean waves. 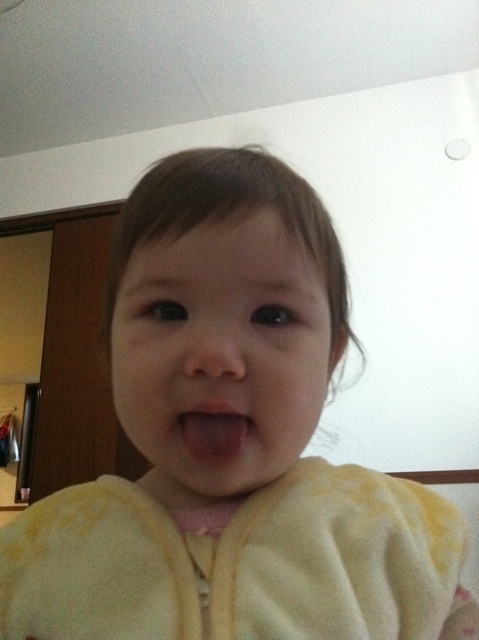 She had her first taste of lemon, and it wasn’t a big sour face, just a little. Tomoe’s becoming better at standing on her own. 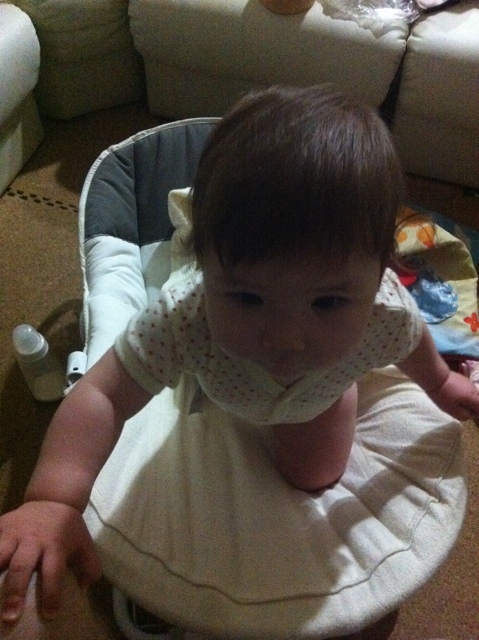 She can go a few seconds without any support before she falls down. I think she’ll be able to walk within the next couple months. 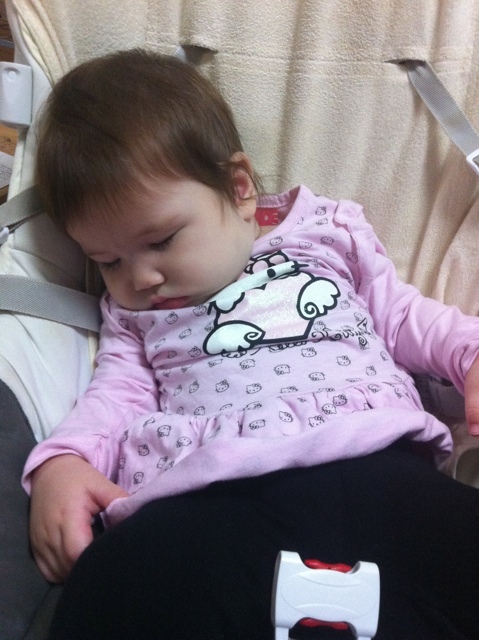 Sleeping with her Hello Kitty shirt. She fell asleep outside, so I didn’t take her sheep vest off when we got home. 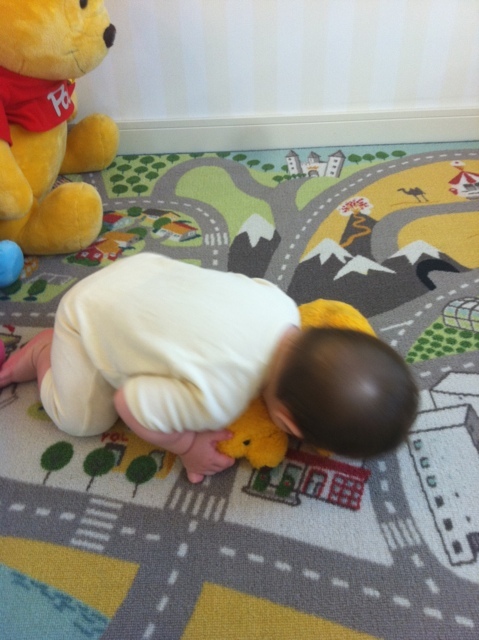 Oh, not a huge Japanese monster baby. She’s walking in the park. 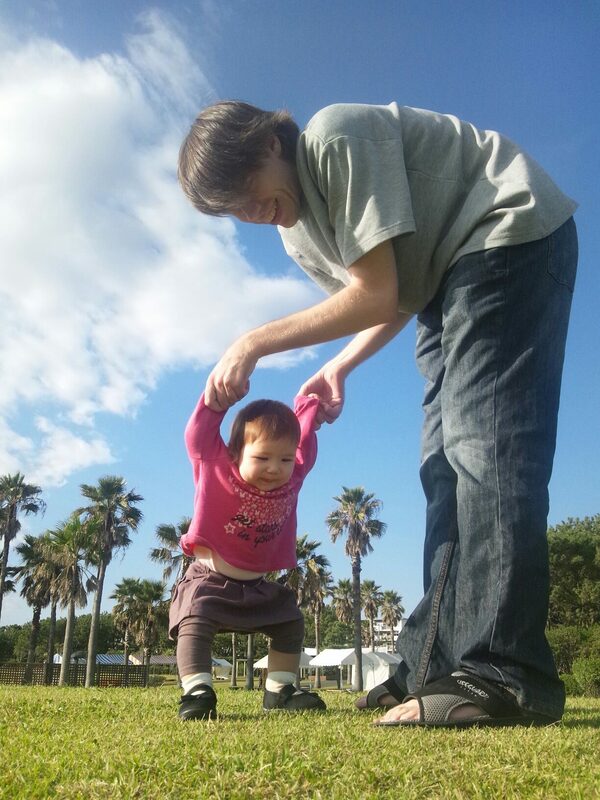 For those last two pictures, we went to Tsujido Kaihin Koen (Tsujido Seaside Park) and she had her first chance to walk on the ground outside with her new shoes. We later went to the beach, enjoyed watching the very large waves coming in. Near Enoshima, we met a dog, and she seems to have no problems with dogs, as well as cats. 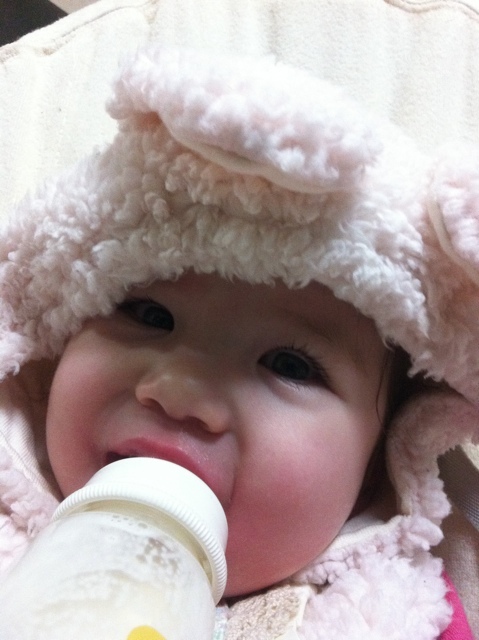 Today, it seems that her cheeks and nose are getting a bit red. My wife and I both have a cold, so we’re wondering if she’s catching our cold. Hope not. 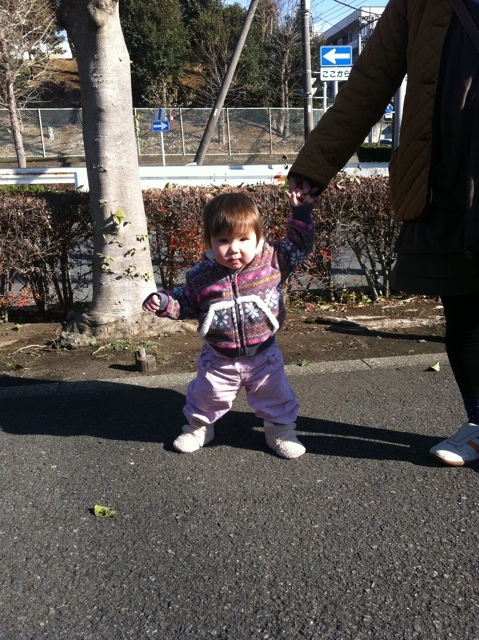 Last Friday, we went out for a walk after lunch, being a beautiful day. We visited Akibadai Cultural and Athletics Centre and checked out some sports related activities (I’m interested in the walking courses). 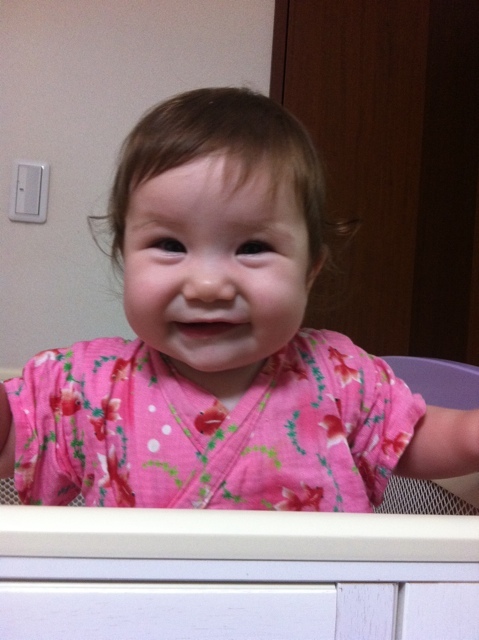 We then visited somewhere I haven’t been since January, the clinic where Tomoe was born. 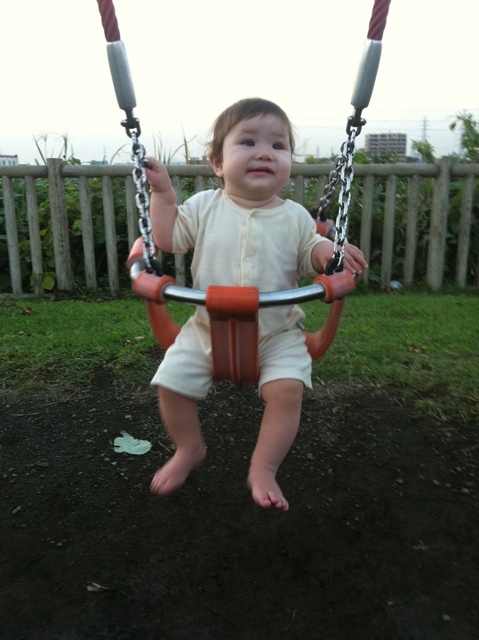 There’s a little play area for children, and Tomoe got to finally play there. 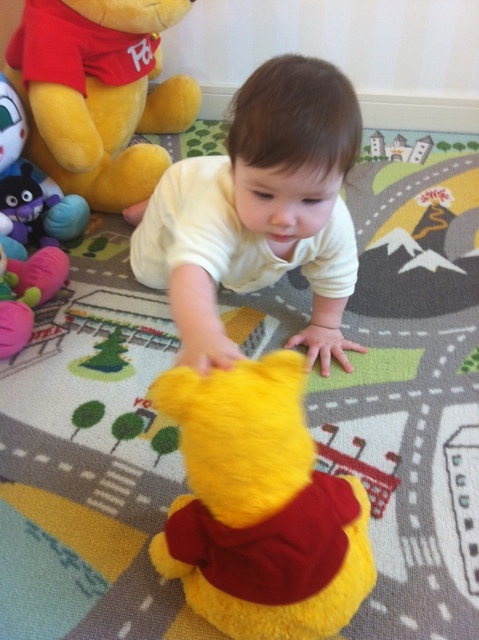 She seemed to really like the big Winnie the Pooh. What a big head you have. What’s this? A little Pooh! We noticed how much fun Tomoe was having with the stuffed toys, we had to get one for her. We found a pretty cheap one that she seemed to like right away. It’s a soft, fluffy stuffed dog. 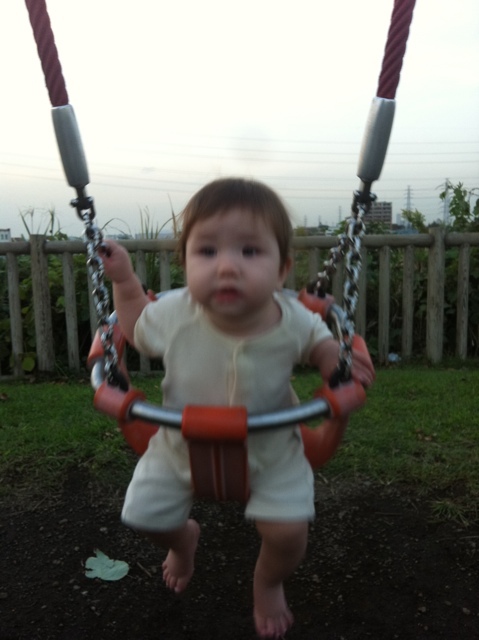 On our way home, we stopped at the playground near our apartment. 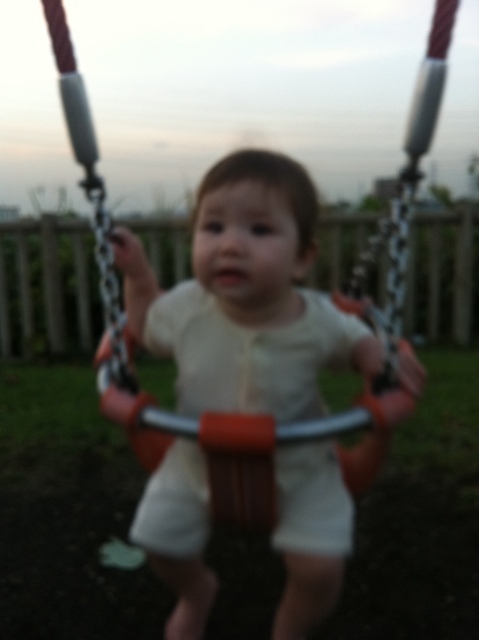 She’d played on the swing earlier in the week, but I never got the chance to see her playing on it. She’s moving so fast, she’s blurred! It was close to sunset, so my iPhone’s camera kept taking longer exposures. So, we get blurry baby! After this, we had a guest. At this point, a young girl, maybe about 7 years old, came up to us and started playing with Tomoe. She seemed to really enjoy playing with her. 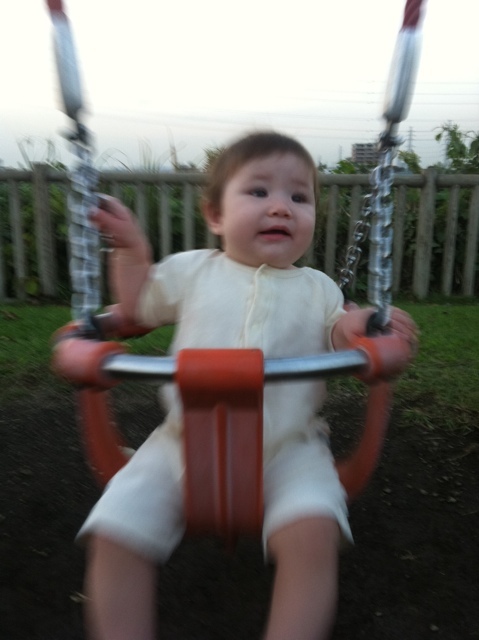 She pushed her on the swing while I stayed in front of her. Tomoe laughed a lot. The girl actually asked me most of the questions, instead of my wife. I answered as best as I could in Japanese. She basically wanted to know how old Tomoe was and when her birthday is. The neighbourhood kids seem to be really nice. On the baby development side of things, Tomoe continues to practice balancing while standing in her bed. She can manage 3 seconds without holding onto anything. She’s also walking from one end of her bed to the other while holding onto the side with one hand. She’s doing a lot of practicing. Unfortunately, she’s been awake until around 2 am a lot recently. 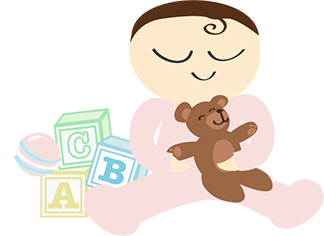 But I’ve heard that babies between 6 and 10 months old tend to have difficulties sleeping through the night. She’s been throwing things a lot recently, too. She likes to grab everything, bang it on something, then throw it. She also has a fascination with the bedroom door. She’ll hold it and move it back and forth. She’s getting very good with her hands. Apparently, babies this age sometimes start waving and pointing at things. Tomoe hasn’t done either. However, she does reach up when she’s about to be picked up. And another thing, she seems to like holding my nose sometimes, and laughs when I rub her feet or hands on my chin. Tonight, she found something rather amusing. 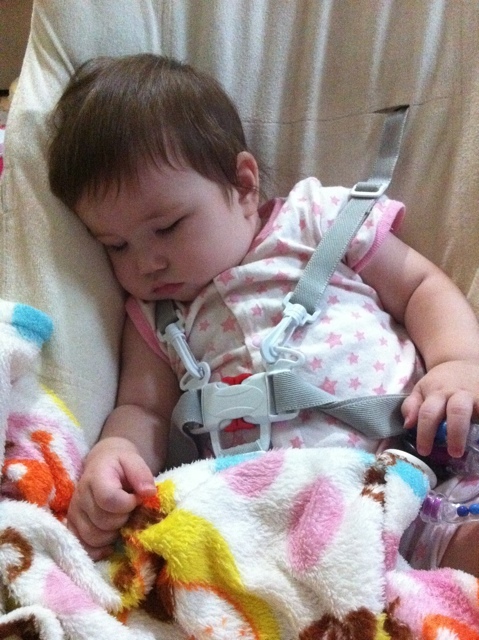 As I was changing her, her clean diaper was sitting nearby, and it was slowly folding up after I’d opened it. She laughed as it folded up. I tried it a few more times and she laughed every time. Her sense of humour is developing. Tomoe’s got some big developments lately. In addition to her growing ability to stand without support, she’s finally reaching another milestone. Her teeth are starting to come in! 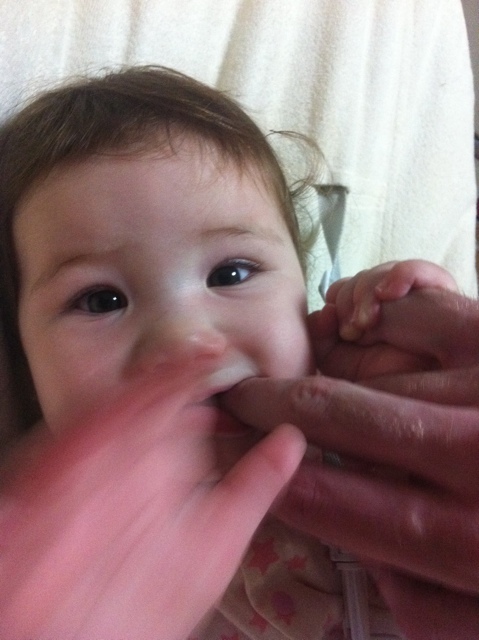 On Saturday, as Tomoe was biting my finger, I noticed her gums felt a bit different. I opened her mouth and looked at her gums, which isn’t a very easy thing to do. I could see both of her lower front teeth through her gums. They were starting to push through. They should be coming out very soon! And now, some pictures, which my mom is expecting me to post. Standing with the support of only one hand. She’s climbing! She really enjoys climbing. She keeps surprising me. Tonight, I was happy to witness three things that she’s learned to do. First, I got to see her standing on her own quite a bit. 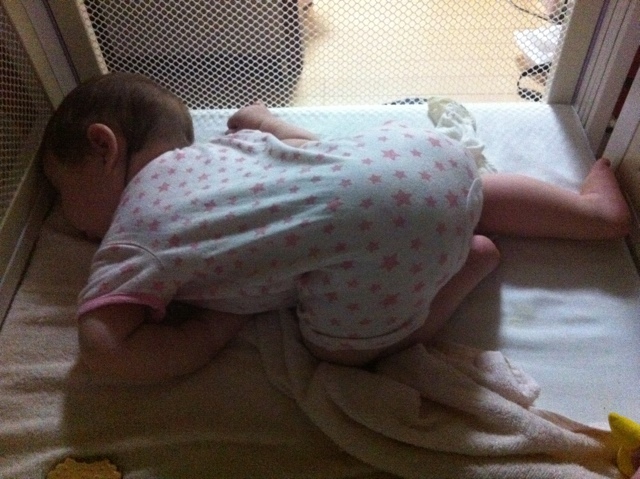 She was in her bed, and she usually holds on to the sides when standing. 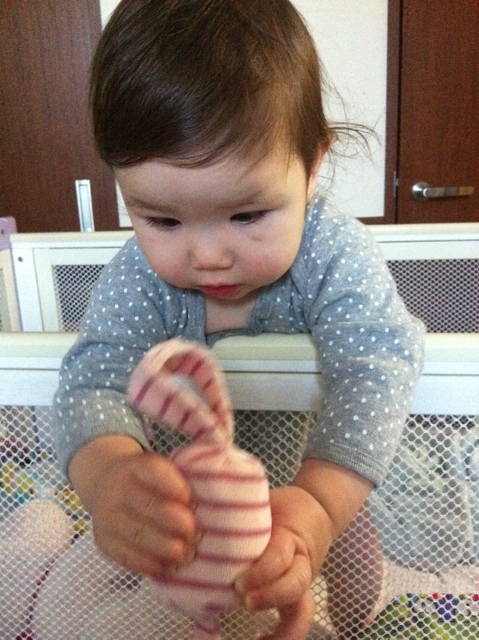 But occasionally, she let go and stood there for a good 2 or 3 seconds without holding onto anything. Her balance is improving, and I wouldn’t be surprised if she’s standing on her own very well in a month or so. 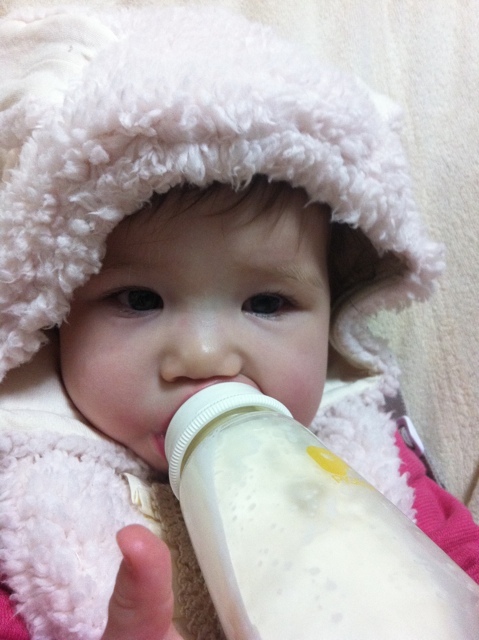 Second, she’s getting better at holding her bottle. She’s learned that if there isn’t much left in it, she should hold it so that the bottom is higher than the top. She’s starting to understand that’s how she can drink. And finally, as I was about to take her out to pick up my wife from work, I said to her, “Let’s go see mommy!” She immediately gave me a big smile and was very happy. She’s understanding more and more these days. I can’t wait to see what happens next. 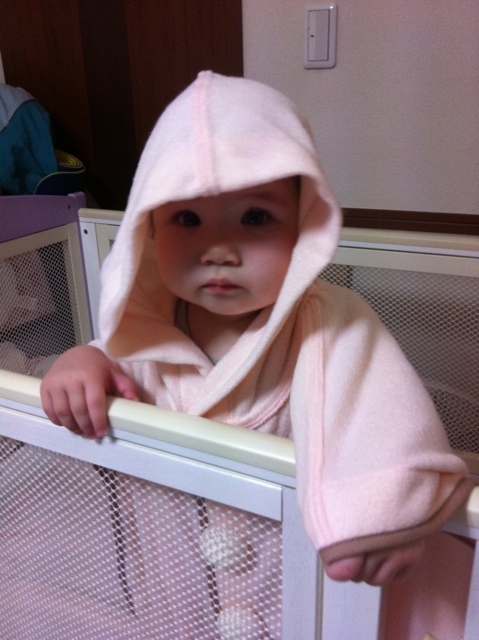 On the 25th, Tomoe turned 8 months old. Hard to believe she’s already that old. She also continues to surprise us. In the past week or so, she’s been trying to stand up without any support. She’s succeeded in balancing for 2 or 3 seconds, but quickly falls down. 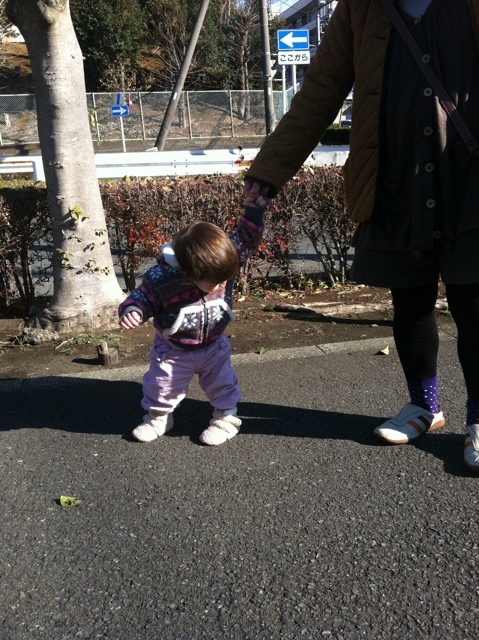 She was early with crawling, early with standing up with support, and now she seems to want to walk early. She’s going to need new shoes soon. On the 24th, she went to the clinic again to get her third round of DTP. I never realised how many shots babies get. 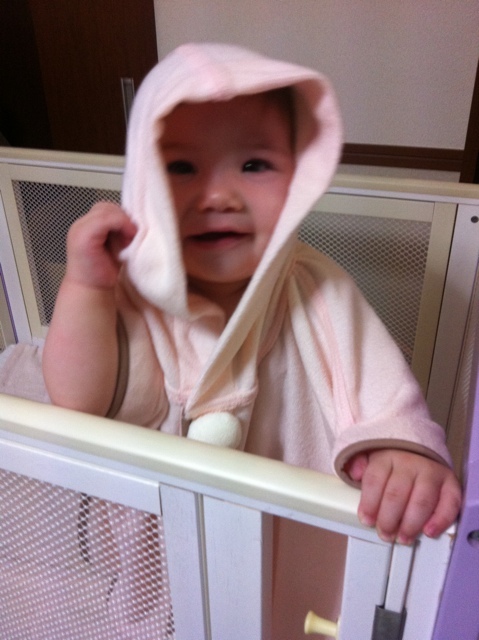 Tomoe’s been so good, she hasn’t cried once. She’s showing definite signs of communication with us now. She responds to her name, gives a big smile whenever greeting us when either of us comes home, and I could have sworn she was trying to copy my wave. She also hates being left alone. If we’re out of view, she’ll start crying. She still sleeps a lot. Sometimes she sleeps in odd positions. With her gums irritating her, she likes to bite things, including my finger. She really likes the feeling. She can bite really hard. Sleeping with her favourite blanket. 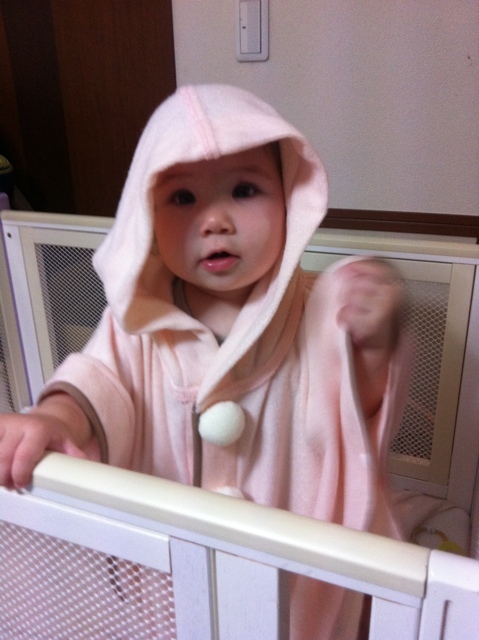 She has a new bathrobe. She seems to really like it. She’s wondering what it is. Now looking a little moody.